If you fancy a bit of 5 star luxury then you certainly won't be disappointed if you book into the Sheraton Fuerteventura Beach, Golf & Spa Resort. The hotel is perfectly located with a golden sandy beach and the clear blue waters of the Atlantic on its doorstep. 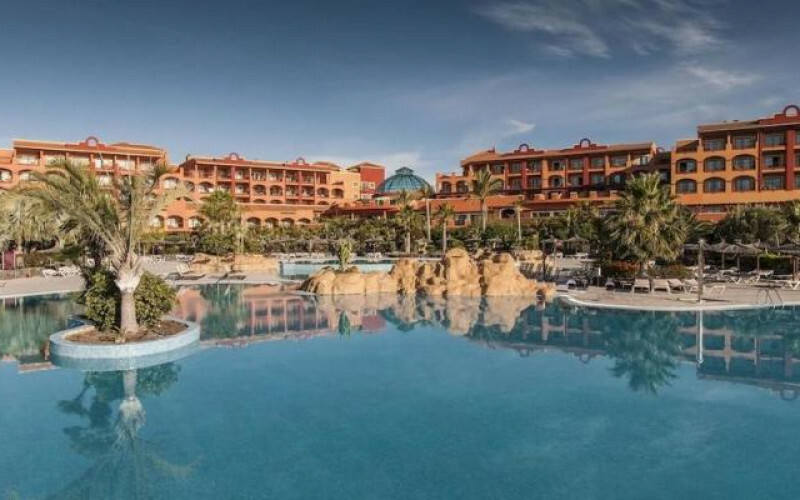 Just a short 10-15 minute drive from Fuerteventura International Airport, the Sheraton is the perfect venue for rest and relaxation for couples and families. The hotel is set between the 18 hole mini golf course and the beach and centred round curvy free-form swimming pools, waterfalls and beautiful landscaped tropical gardens. You can relax on the sun loungers by the outdoor pools listening to the waterfalls and swaying palms with a cooling drink from the nearby pool bar. If you fancy spending time at the beach it's just a short walk to golden sand and clear azure waters with plenty of sun loungers, parasols and of course a beach bar. There is also a children's pool and an indoor pool in the Spa. Sheraton Fuerteventura Beach Golf & Spa Resort has 266 luxury rooms from a standard premier room right up to the presidential suite and as you would expect all are finished to a very high standard. All the rooms are typically Canarian in design and come with either a private balcony or terrace with either a garden view or a sea view. Rooms have a king-sized bed or twin beds, full bathroom, air conditioning, satellite TV, safety deposit box, and tea and coffee making facilities. The premier deluxe rooms are on the ground floor and are ideal for families.